Microsoft on Wednesday unveiled much awaited Internet Explorer 9 Beta and everyone can download it now. This release is focused on pairing down the browser experience so that the end users can easily access, HTML 5 enabled sites. Internet Explorer 9 is full of changes that are future-oriented in the world of web- browsing and some features that incorporated in this new release is talk of the town. After downloading the latest release, I was playing around with the IE9 new features like tab pinning, OneBox, Notifications and much more. The first thing that I noticed after starting IE9 for first time that there are very few buttons visible while you are browsing. This time Microsoft chose to feature minimal design and eliminate any of the buttons and commands which you can see in the previous Internet Explorer versions. “This is due to because many people don’t use these buttons very often and by eliminating these buttons, they had given more screen to the actual sites visiting” as stated by Hachamovitch in an interview with TechCrunch. One thing is to admit that this time Microsoft worked hard on IE9 because of growing threats by browsers like Firefox, Chrome and Safari. But is it enough work done to take away people from the likes of Chrome, Firefox and more ? Well, that I can’t tell you now but one thing is sure that Internet Explorer 9 looks promising this time. And if you are also thinking to try the new web- browsing product from Microsoft, check out 13 key-points you need to know about Internet Explorer 9 Beta. 2) Not going to work in Windows XP : Well, thats surely a disappointment for those who are using Windows XP. The latest product from Microsoft will not work in Windows XP and it is only going to work in Windows 7 and Windows Vista with Service Pack 2. The reason behind the elimination of Windows XP because IE9 takes advantage of Windows 7 and Vista’s DirectX capabilities for graphics hardware acceleration and Aero desktop features. 3) Replace early IE9 version : The new beta totally replaces your Internet Explorer version that you are currently running. It means you can’t use IE9 with your latest version side by side unlike the early Platform Preview editions of IE9. 4) Favorite button bar is gone : To make a clean minimal design for new IE9, Favorites button bar is gone by default that you can re-enable them from a right click menu at the top of the browser or from the start Favorites button. 5) The One Box : Chrome users already experiencing this feature in which Chrome offers one box for both Web addresses and web search. 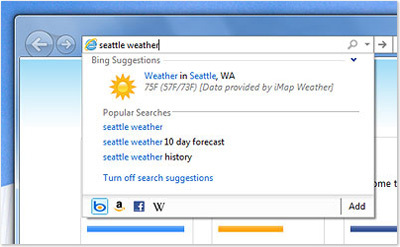 Now, IE9 works the same way with the only difference that the search experience is all Bing. The new feature goes beyond search with the ability to view yours words as you type. You can request weather, movie showtime or addresses right inside the box and the results suggested are quite relevant. 6) Pin websites to Windows 7 taskbar : This is really a cool feature which I like the most. 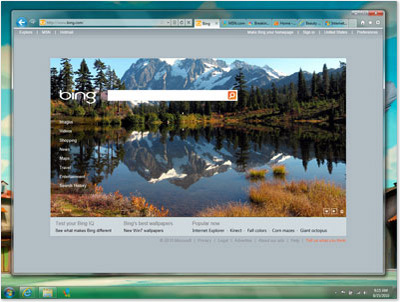 By using this feature, you can pin sites to your Windows 7 taskbar that you regularly visits. 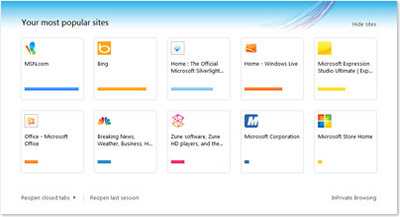 It allows you to access those sites directly from the taskbar on your Windows 7 desktop. When you open a pinned site, the website icon appears at the top of the browsers and the back and forward buttons change color to match the color of the icon. This feature only available in Windows 7 and add jumplist choices to the taskbar icon, for jumping directly to specific site tasks. For an example, if you have pinned Facebook, you can right click the icon to directly to your news, Messages, Friends and Events pages. 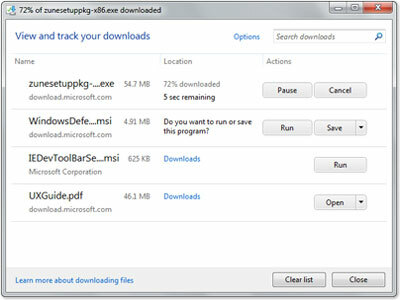 7) Download Manager : This is new feature in IE that keeps a running list of the files you download from the Internet and also notifies when a file you are downloading is malicious. This new feature is accessible from the gear menu under “View Downloads” name. It also lets you pause and restart a download and shows you where to find downloads files on your computer. 8 ) Notification Bar : The notification bar that previously appears at the top the webpage, now appears at the bottom of the Internet Explorer screen, It gives you important status information when you need it like warning your downloading or password remembering but it won’t force you to click messages to continue browsing. 9) Welcome New Tab Page : This a new feature that you had already seen in Chrome and Safari. The new tab page has been introduced in the latest version of Internet Explorer. The new tab page shows you the thumbnails of the your most-frequently visited sites, giving one click access to them. It also displays the site’s icon, title and a bar to indicate the relevant frequency of visits. 10) Enhanced Tabs : This is one another welcome feature which Microsoft introduced in IE which is similar to Chrome, Safari, Firefox and Opera. IE9 had the ability to move tabs between windows by tearing them from the tab bar and dropping them onto other windows or new windows. The added benefit in IE9 is that it still continue play video or music as you drag a tab out and tabs behave like Windows 7 windows. Also, tabs are color coded to show which open webpages are related to each other to give you a handy visual reference as you click between tabs. 11) HTML5 support : IE9 supports HTML5 sites. It means you can open websites designed in HTML5 language, Also, it supports SVG, Canvas graphics and also play some HTML5 video and audio. 12) Add-on Performace Advisor : I like this feature that allows you to disable or remove any add-on which is slowing your browser performance. 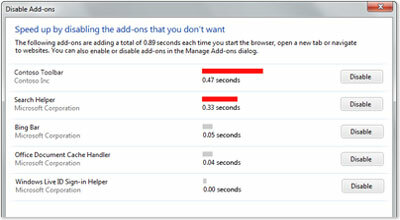 Add-on Performance Advisor tells you if an add-on is slowing your Internet Explorer browsing performance and then allow you to take further action. 13) Hardware Acceleration : Internet Explorer uses the power of computer graphics processor, also known as a GPU to handle graphics heavy tasks like video streaming or online gaming. By tapping into the GPU, IE9 delivers a faster and more immersive web experience. A few sites don’t render correctly or sometimes quickly. There is a compatibility mode that you can use to fix some of these rendering problems. Its still in beta release so you can see some of the features that can be added or removed in the final stable release. But, I am really looking forward to use the final release and what about you? Are the above features influence you to use Internet Explorer 9, tell us in the comments section below.